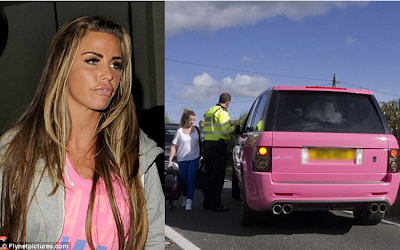 Katie Price rushed to the aid or her personal assistant tonight after she crashed her car in a ditch. Police were called after the accident which happened near the glamour model's home in West Sussex. 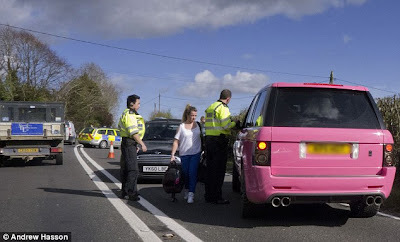 The 33-year-old drove her pink Range Rover to the A272, just outside Cowfold, after the woman's car left the eastbound lane about 6pm. A motorist told the Mail Online that officers were speaking to the driver through the window as other policeman waved cars through slowly. 'I was driving along with my wife, and I live near here so I drive up and down this road all the time. 'It's a very narrow road and there's nowhere to park or stop or anything. 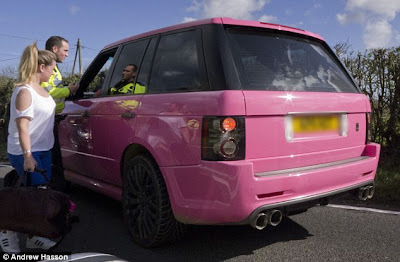 I saw a pink car and thought "I bet that's Katie Price's". A spokesman for Katie said her PA was not injured. And to avoid any confusion, Katie tweeted a photo of her, boyfriend Leandro Penna, and a woman named Catherine, believed to be her assistant. They are seen leaning on her car. West Sussex police were unable to comment on the matter. In April last year Katie was left with severe whiplash after two stallions ran into the road and smashed into her 4WD, which Leandro was driving.